Ynetnews reports: The wave of terrorism in Jerusalem has the district’s police force working round the clock, going from one crime scene to another, sometimes without a moment’s rest while on duty. The police’s bomb squad is working particularly hard: disarming bombs, examining suspicious vehicles and objects and checking for explosives at scenes of terrorist attacks. Master Sergeant Alex Pekerman, 27, stands out among them as she is the first female bomb disposal specialist in the Jerusalem Police. She joined the team just six months ago, just as hostilities erupted. 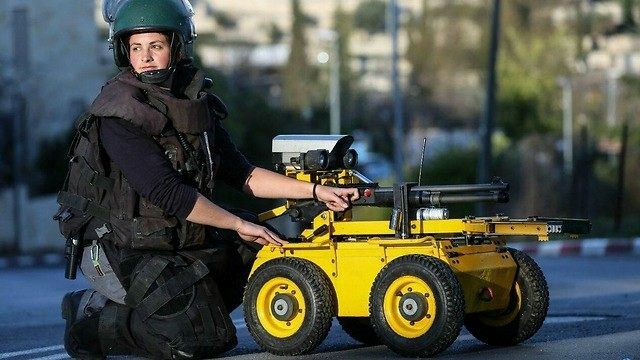 She arrived at her current job in the Jerusalem Police after completing a degree in biology and geology, which she says includes many topics that are relevant to her job, such as physics and chemistry.